Keepvid.com has really changed since the time back in 2012 when I wrote my first review of Keepvid.com. It’s been 5 years and the site has become one of the top 5 resources to download video and audio from multiple online sources. if you don’t want to read my thoughts on Keepvid, jump to the step-by-step tutorial now. So much so, that it now has imitators, for example, keepvid.site is one of them, and is pretty popular too. Keepvid.guru is another example, only it’s not an imitator per-say, it only partakes of the name, the insides are well different.. Thus keepvid’s [Official] note in their main page title. Yes, you might have noticed, this site, as well as Savefrom, doesn’t have any ads. Anymore. 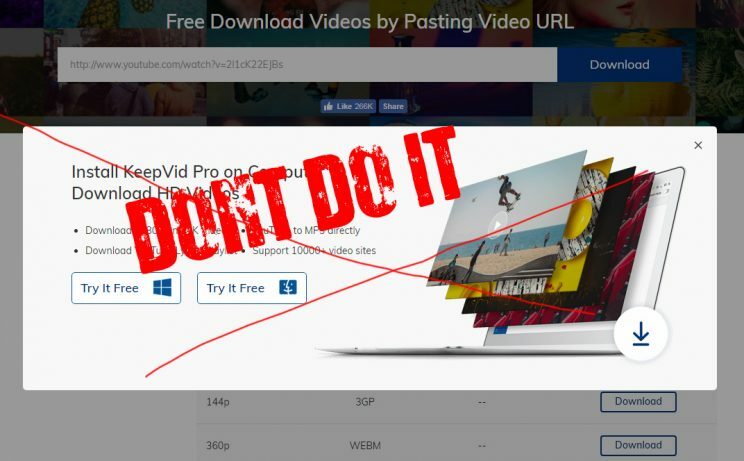 If you’ve seen my first review, Keepvid used to be overwhelmed with ads, it was trying and trying to get you to click somewhere accidentally to open a popup. Not anymore it ain’t. So, how do they survive without ads? I am sure they are not altruistic and aren’t just existing for people. Judging by how many ads there were before. Now without ads the way to revenue is Keepvid Pro which is a standalone piece of software (same like Savefrom.nat with their Ummy Video Downloader) that requires subscription for full access. It’s boasted with many features, but it’s not free.. We like free methods to download videos from youtube. Right? There’s also a browser addon (which is called Keepvid Helper, just exactly same as SaveFrom Helper) and a mediocre app that doesn’t do what it promises, according to reviews. Well, maybe its official Google Store version doesn’t do much, because it has to be limited thanks to Google Play’s TOS, where they prohibit any software to mess with youtube as in help solicit illegal downloads. I will not be going over those, I’ll discuss them in other articles later. For now we agree, Keepvid.com has followed in footsteps of Savefrom.net, and I won’t be surprised if KeepVid Pro is exactly like Ummy Downloader.. Ok well, enough “investigating”, let’s get to downloading! Below is the step-by-step graphic tutorial with screenshots that’ll help you figure out how to use Keepvid.com to download online videos. Now you see that white box on top? This is where the video URL goes. Press enter or click download button for the next step. Now we have to be a little bit careful. As you can see on the screenshot 2 below, Keepvid does offer 1080p download, what a surprise! But what a disappointment – the 1080p they offer will have no sound. Don’t be surprised, this is how they let you taste 1080p, so that you’ll then get their paid software KeepVid Pro, which allegedly allows full HD downloads with sound. Well, we don’t go that far, we’re just testing. And so I go for 720p download and just to test out – the 1080p soundless download. You can see above I’ve circled the 1080p download. They even have a link that’ll help you with merging 1080p video and audio. From my personal experience, it can be easily done with ffmpeg (free command line software for audio and video manipulations). But I’m quite savvy with video. I do not think first time user can actually tame ffmpeg.. I didn’t even look into that link they give, cause merging audio and video (muxing) is very complicated..
Again I can see that downloads are happening directly from youtube. Funny how it happens.. One at home can hardly find the video source to download it and watch.. While all these sites and software and plugins can easily do it.. Why? Because it’s all on the surface, it’s just hard to notice it, if you’re human. Software actually has to receive the address of the video that it’ll stream (like your browser). Keepvid does offer 256kbps & 320kbps audio download via their other software – Keepvid Music. What noone really thinks about ever is that youtube doesn’t offer more than 128kbps audio. 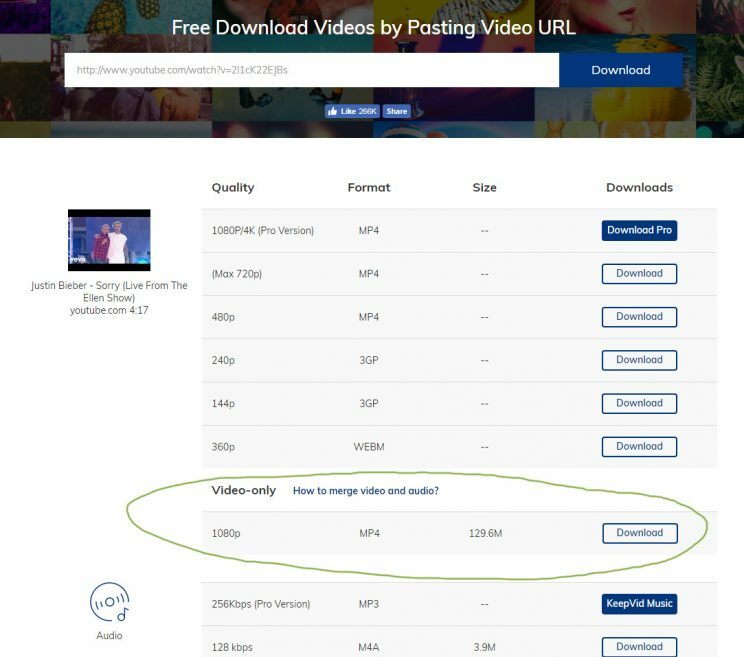 How do they promise to give you 320kbps HD audio sound, when the only option youtube gives is 128kbps m4a, that could be up-encoded to 160kbps, since m4a is VBR which sometimes can reach 160kbps.. This is impossible. From other sites – yes, maybe, some allow for better audio, but youtube only gives 128kbps. So do not expect good sound when downloading from youtube. Even with software that promises 320kbps audio.. Don’t trust!! I tried using this I think this is not working anymore. You can use Acethinker’s Video Keeper as an alternative.